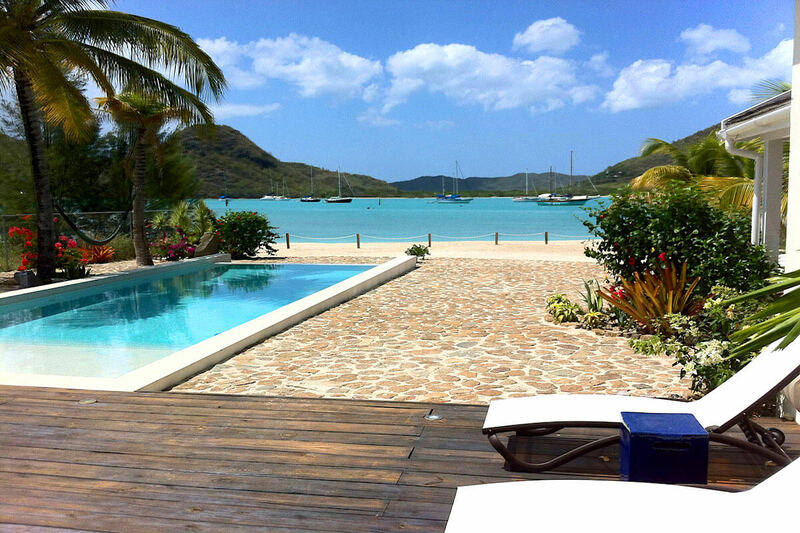 Villa Antigua - Jolly Harbour #008 is a great choice for travelers who want to experience island living at its fullest. It’s within walking distance to restaurants, the grocery store, and bars, and you can walk to the harbor to take a day-trip sailing, snorkeling, or touring the numerous beaches along the coast. You’ll have harbor views with mountains in the background, and plenty of activities nearby to entertain everyone in your party. Villa Antigua - Jolly Harbour #008 sits on a private beach that flows into the harbor and the Caribbean Sea. Due to its location in a quiet, residential area, guests can expect peace and quiet as they relax in paradise. With a private beach and a slice of the ocean in the backyard, the villa has the most important part of a Caribbean vacation taken care of. An infinity pool sits on the side of the deck, with a hammock and oversized sun bed nearby for lounging and unwinding. The fitness area on the upper balcony is great for morning workouts, and guests can stay outside all day thanks to the BBQ and al fresco dining area. The outdoor lounge blends with the indoor living area, which is equipped with an entertainment system, flatscreen TV, and small study. Guests can cook on top-of-the-line appliances in the large kitchen behind the living area, and a cup of coffee at the breakfast bar. Each of the four bedrooms has a TV and an ensuite bathroom with a shower. The master bedroom has a king-sized bed, ocean view, and exterior access to the terrace. Two bedrooms have queen-sized beds, and the fourth bedroom has two twin beds. Jolly Harbour has the best of both worlds. It’s near town, but peaceful. Tennis courts, shops, water sports, and golf are nearby, and the nearest restaurant is only two minutes away. Jolly Beach, one of the best beaches in Antigua, is located a few steps from the villa. When we arrived at the villa, it was very unassuming… you won’t get the full vision of the size and beauty of the home until you actually walk through the front doors. SIMPLY AMAZING!!! The views are breathtaking, the house is laid out well, the outdoor entertainment space is enormous, and the pool is to die for! The kitchen is amazing for any cooking you choose to do at home. This is probably one of the few villas where you can actually go out the back door into the pool. Out of the pool and 30 steps more puts you in the Caribbean! If you want even more, right across the street is a wonderful, mile-long beach that is simply stunning. Giuseppe was amazing, a pleasure to meet, and willing to help out in any way. We highly recommend visiting this villa - especially if you are looking for beautiful views and privacy at the same time. This is definitely a villa we would love to visit again! Our experience with WhereToStay was seamless! Andrew was amazing and worked with us to locate an alternate villa when it was determined that the original one we chose on the East side of Antigua was invaded with seaweed. His knowledge of the area and villas was paramount with us choosing Out of the Blue.